It's fun to make different monstrous faces for jack-o'-lanterns, but afterwards, you're left with all these pumpkin chunks that need to be used up. So what do you do? Aside from the usual pumpkin pie, you can also use the pumpkin flesh to make a creamy pumpkin soup. 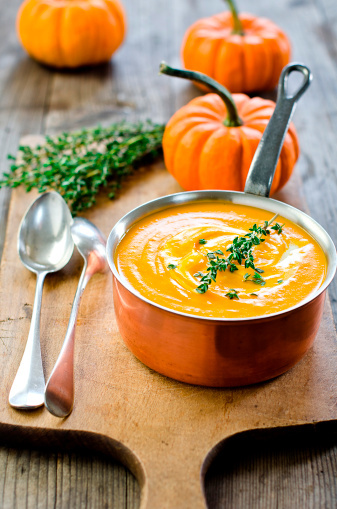 This Halloween pumpkin soup is easy to make in a pressure cooker. Grated apple and bay leaves add subtle flavours that make this pumpkin soup truly delish! Melt butter in the pressure cooker. Add pumpkin chunks, potato, onion and a pinch of curry powder. Gently cook over low heat until onion is lightly browned, stirring occasionally. Add the chicken stock, black pepper and bay leaves. Secure the lid and bring to pressure. Cook for 5 minutes. Release pressure using the cold water release method. Stir in the grated apple and cook uncovered for 10 minutes, stirring occasionally. Remove the bay leaves. Transfer the soup to a blender and process, adding milk until soup is creamy and smooth. This pumpkin soup is best served with a few croutons. To fully get into the spirit of Halloween, add a swirl of cream in the shape of a spider web before serving.